In mid metallic blue with a black vinyl interior. This S3 Elan was purchased by its last owner from Christoper Neil Sportscars in 1987 as a damaged car but with a new galvanised chassis and a new S4 body shell, S3 shells being unavailable at the time. The car was then passed to Lenham Motor Company who rebuilt it over a three year period with a rebuilt engine, rebuilt drivetrain, brakes and suspension. The restoration is documented with many invoices and some photographs. It has covered just over 18,000 miles since going back on the road in 1990. There is a substantial history file with countless invoices from Paul Matty, Daytune, and Len Street, Chelsea. In 2005, about 3,000 miles ago, the Lotus had a full engine rebuild by B.L. Motors of East Barnet and a QED rebuilt and unleaded cylinder head with a Q360 camshaft was fitted. The radiator was upgraded and an extra cooling fan installed. The twin Weber 40 DCOEs have been tuned and the car goes really well. New rear Spax shock absorbers were fitted a few miles ago along with new Rotoflex couplings. It drives beautifully having received constant care for the last twenty nine years. It has only had four owners since new. The Elan has electric windows, knock-off wheels, a rare Lenham hardtop, and a hood tonneau. In 2012 new carpets were fitted and the seats improved. The bodywork has received some marks since the rebuild and remains in good, clean condition. 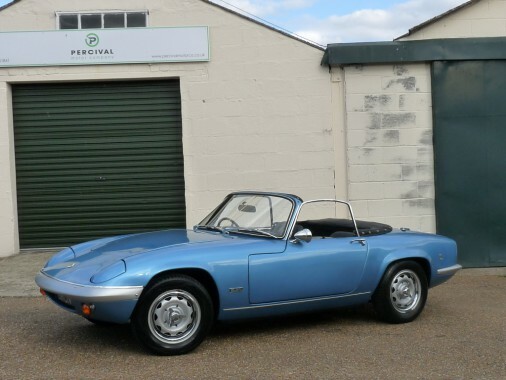 The Elan is a superb driving car and is ready for using and enjoying.